Welcome to our personal journal. 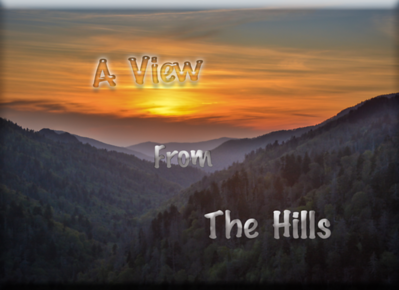 Our goal is to share with you our unique take on a variety of subjects as well as stories of our personal adventures and memories of life here in the Smokies. We hope to give you a glimpse into our world, what drives us, and also a little bit of knowledge about the areas and subjects we encounter along the way. Feel free to contact us or share your comments below. We like to "live on the edge" as they say so we decided to share another adventure. 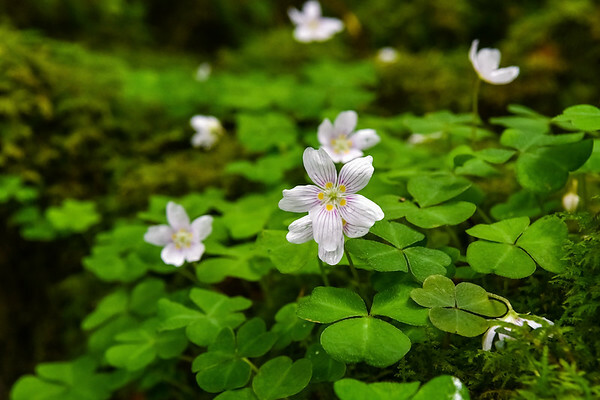 Firstly, we love photographing wildflowers, knew it was about time for Wood Sorrel and hoped it might be blooming on one of our favorite trails. The forecast was calling for severe storms but we decided to take a gamble, trusting we could get out and back prior to the rain's arrival. So up the mountain we headed with an eye on the sky the whole way. As the clouds swirled and danced overhead we knew that the weather was about to change. Unable to resist, we stopped long enough to capture this image to show you what was coming. Ominous skies from Clingmans Dome Rd. What we didn't anticipate was that the rain hadn't planned on stopping anytime soon - so partially covered by an umbrella we set out. We've been to that bridge numerous times, but did you know that heavy rain can make your brain soggy and forget things? Consequently, we took the long way, bush whacking and climbing over wet logs that we hadn't remembered ever seeing before. 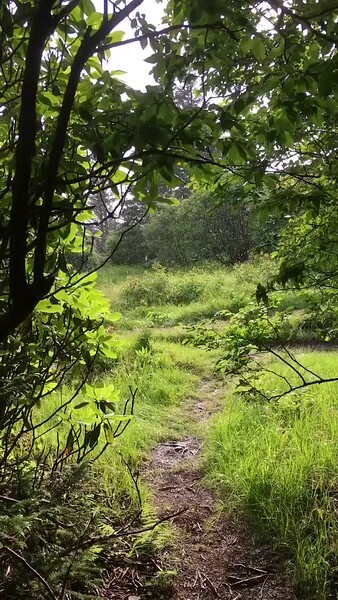 We stood under the umbrella, in puddles during a downpour, captured some images and headed back. 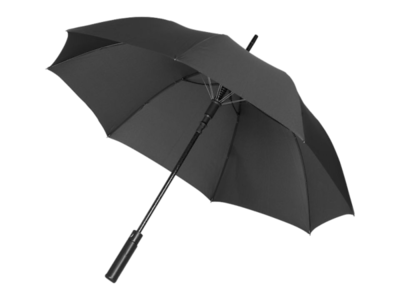 I stood under the lift gate and realized that a tree I snagged the umbrella on must have crippled it because it was not about to close. And it never did. Soaking wet but laughing at ourselves we headed home knowing that today will be remembered as another time that we didn't follow common sense but instead decided to keep going. Sometimes in life things go a little sideways, but to us, giving up is not an option we allow ourselves. Forging ahead and creating lasting memories outweighs that any day. Sort of like being kind. Any day ending in Y is a great day to be kind. 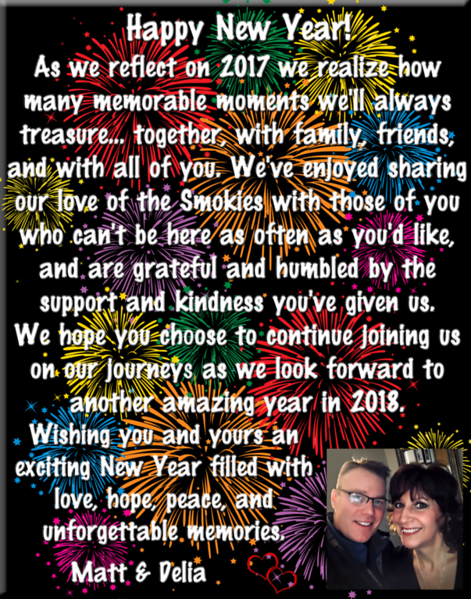 We have shared several of our adventures lately and didn't want to let this one slip by. We've had some wonderful experiences, some with very important lessons attached that truly hit home with us. On this warm, spring day we hiked out to Andrews Bald, a hike we've trekked many times. We knew that it would take us just under two miles but descend nearly 900 feet along the way. It may not sound like much, but for those who've hiked it know that it's mostly climb on the way back. 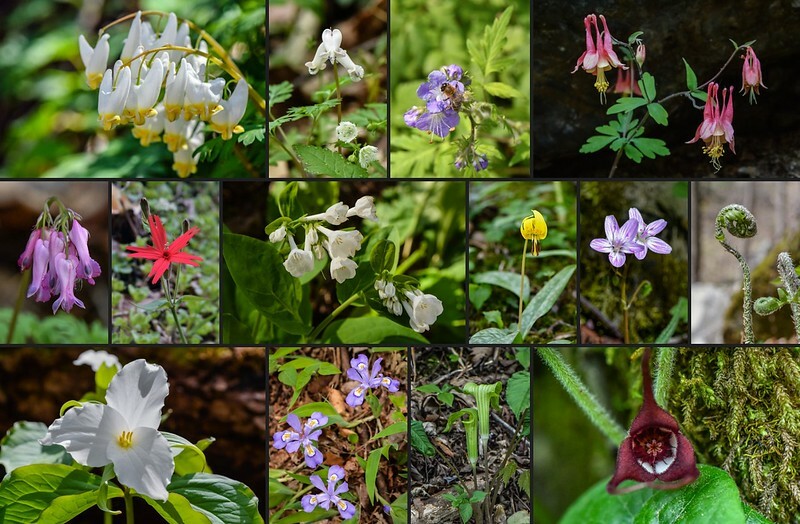 About halfway in we spoke with three very nice gentlemen who informed us that the reason for our hike, to photograph the rhododendron and flame azalea on the bald, were both "past peak" and "not quite there yet". Disappointed but determined we decided to soldier on and enjoy the journey, even if the destination would be less than ideal. We discovered all sorts of gems along the way... wildflowers, mushrooms, and mountain views; anticipation filled every step. Just as we reached our destination, it began to rain. We realized that those to whom we'd spoken were right... the rhododendron blooms were mostly past peak, and the azalea were merely beginning. 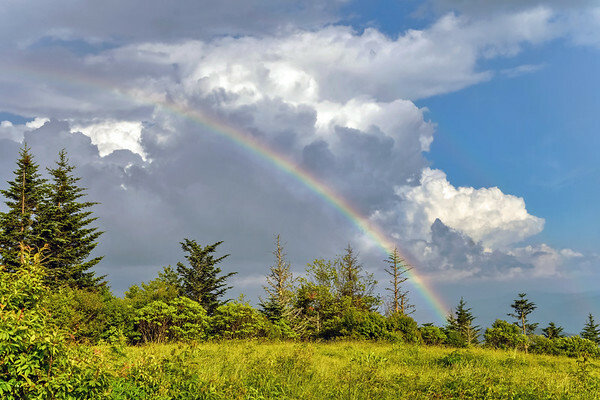 We sought shelter under a stand of pines and thick brush as the rain fell, but with the sun still shining we knew that it was likely a cloud burst overhead. As soon as the rain began to ease up, we ventured out from the shelter. The warm light of the sun as it touched the earth and the passing clouds overhead were simply astounding, shown below. As we looked to our left, lo and behold there was a rainbow above the mountains that took our breath away. We walked the bald in amazement but were concerned about dark clouds in the distance that seemed to be approaching. Much to our dismay we thought it best to head on back, unsure of what the impending storm might bring. Suddenly the darkness set in and more rain began to fall, so we picked up the pace. Up the rock boulder steps and across the wooden beams, we moved as quickly as possible without slipping on the wet terrain. Suddenly the clouds began to part, and the sun broke through. 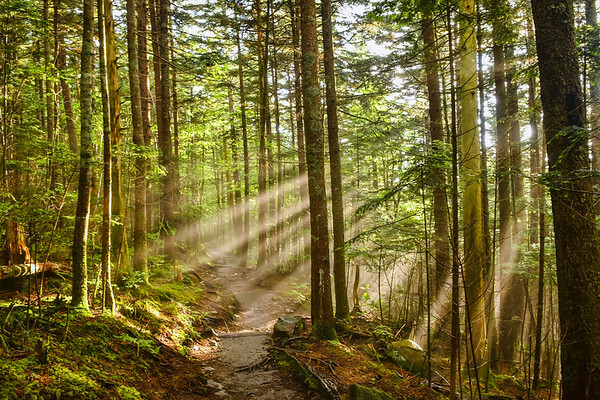 Looking back, the beams of light were streaming through the trees. Overwhelmed and blown away by the beauty, we froze in our tracks, our mouths agape. We knew at this very moment, like we never had before, that pushing on regardless of the reward, would be its own reward. 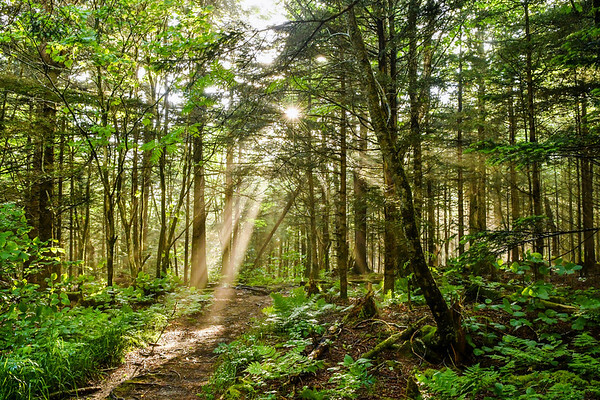 Every day in the Smokies you'll discover a little bit of "magic" if you’re passionate enough to get out and seize those moments. to time, sometimes to take a moment, photograph something, but to take it all in and reflect on just how blessed and fortunate we were on that fateful night. We have shared with you through the years, our journey, both the physical one and the emotional one. We feel like we've taken you along with us. 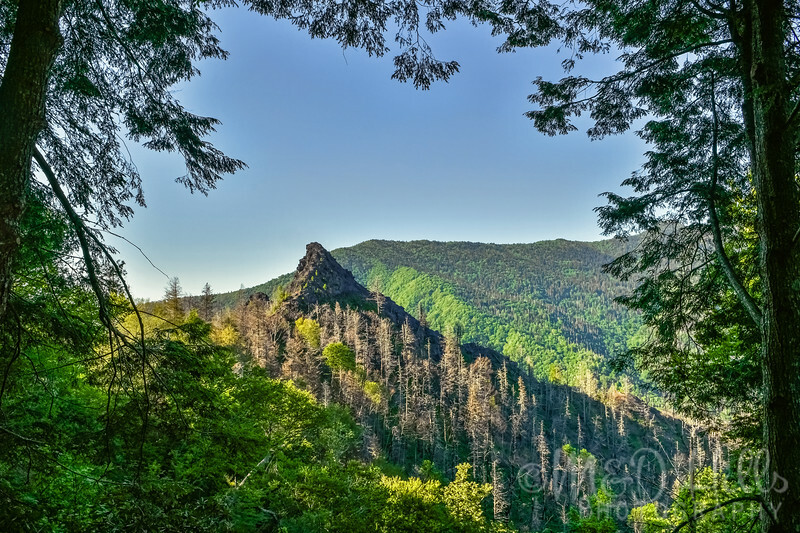 On this day we humbly share a view of Chimney Tops, 2018, still rising up as a sentinel, reminding us all to be strong in the face of adversity but somehow accept being changed, forever, from the experience. We are humbled and grateful for all of your support. 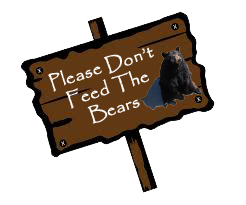 In response to the recent incidents regarding black bears in our area, we feel compelled to speak up on their behalf. This post isn't intended to invite controversy, but rather to share our perspective, personal observations, and most of all, our sadness. 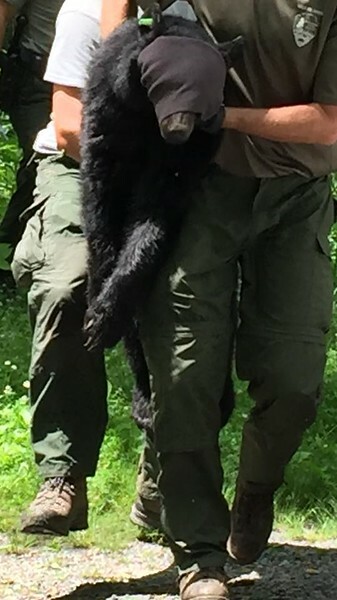 Many of you may have already read or have seen on the news the encroachment in Cades Cove in recent days and/or about a mother bear and her two yearlings euthanized right here in Gatlinburg over the weekend. We thought long and hard how we felt about it. Naturally we were outraged and upset... but at who? As much as we wish we could influence the TWRA policies which seem hasty and indiscriminate, we know that we cannot. Rather, we hope that the TWRA never has to make the difficult decision to put another bear down. That begins with all of us. We sincerely believe that not some, but all of this could have been prevented. We as humans should first educate ourselves if we wish to visit bear habitat. They were here first, and we have moved into their area. 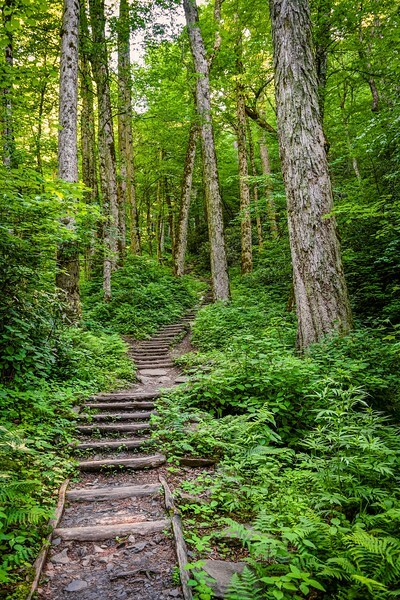 The idea of seeing these amazing animals in the wild is why many choose to visit the Smokies. They are iconic, beloved, and it's our responsibility to treat them with the respect they rightfully deserve. It should be noted that the images we share with all of you are taken with telephoto lenses; equipment we've acquired so that we're able to view and capture them doing what bears do naturally, in their environment. Countless times we've witnessed the insanity when bears are seen and common sense disappears entirely - bystanders not knowing that capturing that rare moment may have devastating consequences. Please realize that we are not here to point fingers or even assume that any of you are to blame. Contrarily, our hope is that if we could reach just one person who might think first and realize that their actions may impact the life or death of that animal, then we feel our time may have been well spent. The following images were passed along to us and we're uncertain who the photographer(s) were. 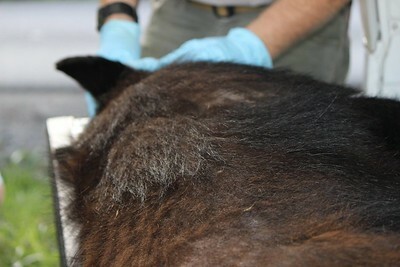 When a bear has lost its fear of humans, park intervention including "aversive conditioning" is the technique used by park service biologists. Including but not limited to, the animal is either trapped and/or tranquilized, sedated and immobilized, tagged, a tooth extracted and tattooed inside the mouth for identification. This approach is administered to restore "natural behavior". If relocated, their destination is unclear. That information is not released to the public. Furthermore, although it might seem like the most appropriate measure to relocate a "nuisance" bear, it's not necessarily in the best interest of the animal. "Capturing and moving bears out of the Park is certainly an option, but not without potential harmful consequences. We know that bears captured and transported out of their home range (e.g., out of the Park) are struck and killed by cars, killed by poachers, or killed during the bear hunting season. We also know that these bears, particularly cubs, are vulnerable to being killed by other bears, coyotes or dogs. Adult bears also have incredible homing instincts, and often return to the area they were captured. In doing so, a mother bear could become separated and leave her cubs in her attempt to return. For these reasons, we try at all costs not to capture and move bears unless they are actively trying to get people’s food, and when all other techniques, including the tools you observed, are not working to maintain their wild behavior." Bears are not typically aggressive toward humans, but they are wild and need to remain that way in order to survive. Locating food is their sole motive, especially when natural food sources are unavailable. Year after year, bears are moved as a result of human actions, through no fault of their own. Although it may seem like common sense, it's imperative that we NEVER, EVER feed wildlife, nor should we advance on them too closely or rapidly for the safety of all involved. It's THEIR environment as much as it is ours, and we must respect them in order to coexist. 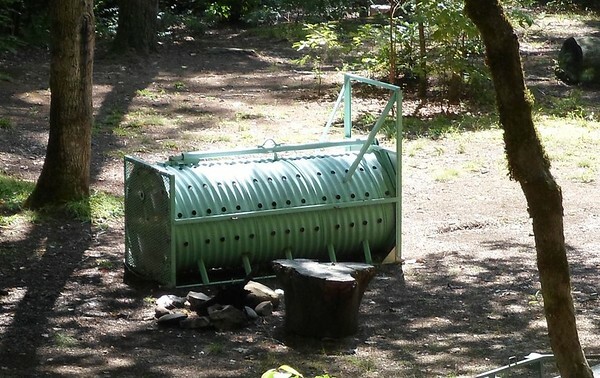 Picking up after yourself and disposing trash in bear proof garbage bins is also important. If you witness any illegal activity, don't be afraid to speak out. Be that voice for those who cannot speak for themselves. Although disturbing, these are facts, and the bottom line is, if you want to see wild, black bears remain in the accessible areas of the national park, please show them the respect they deserve. And let's respect each other with common courtesy and use the pull-offs if you decide to stop. Please help us help them by sharing this important message with others. The words resonated within us as we gazed up high. 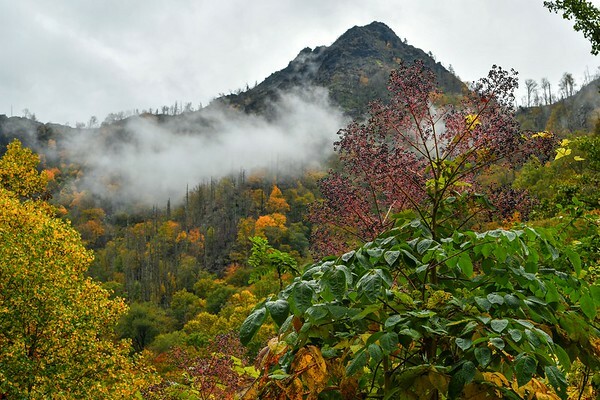 While the summit of Chimney Tops has been damaged, scarred, and will never look the same, there are signs of renewal and resurrection all around. 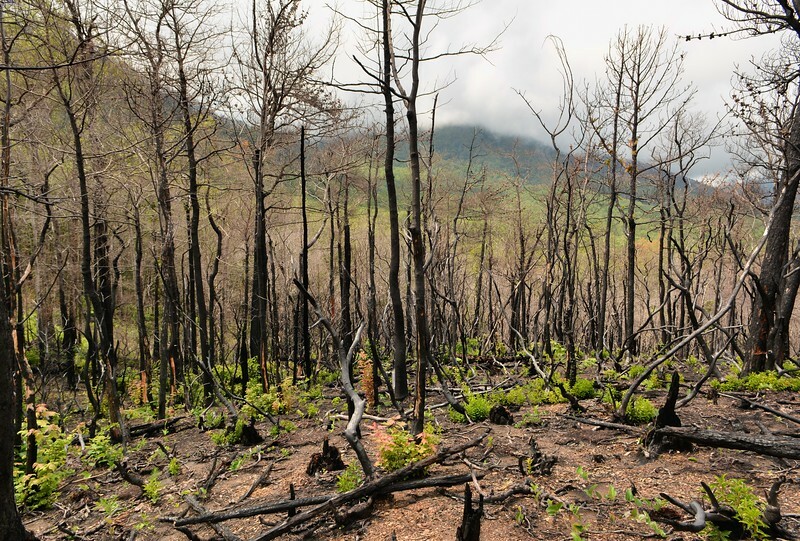 Mother Nature has a way of healing herself even after being the victim of such unspeakable harm. We have faith that this pinnacle, as well as the community of Gatlinburg - cherished by so many, will once again, "Rise Up." Several weeks ago we spent some time at one of the overlooks at Roaring Fork. 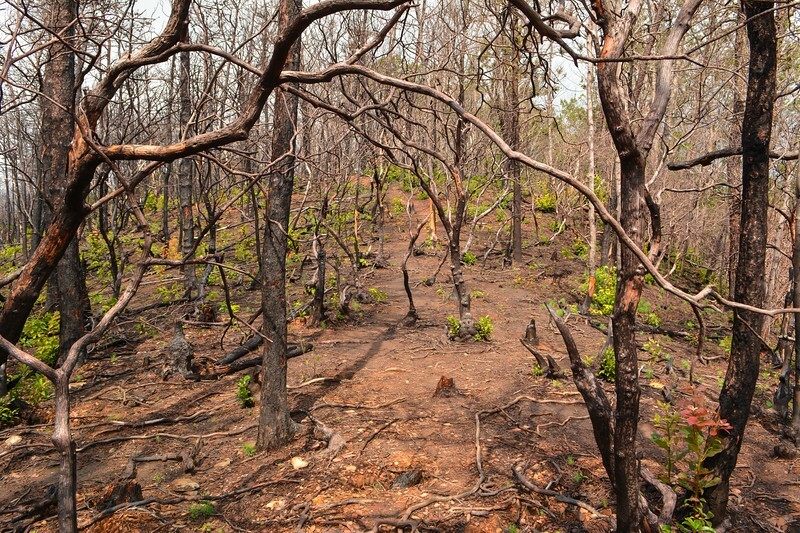 It was an area that was greatly impacted by the firestorm, as was much of that entire region. 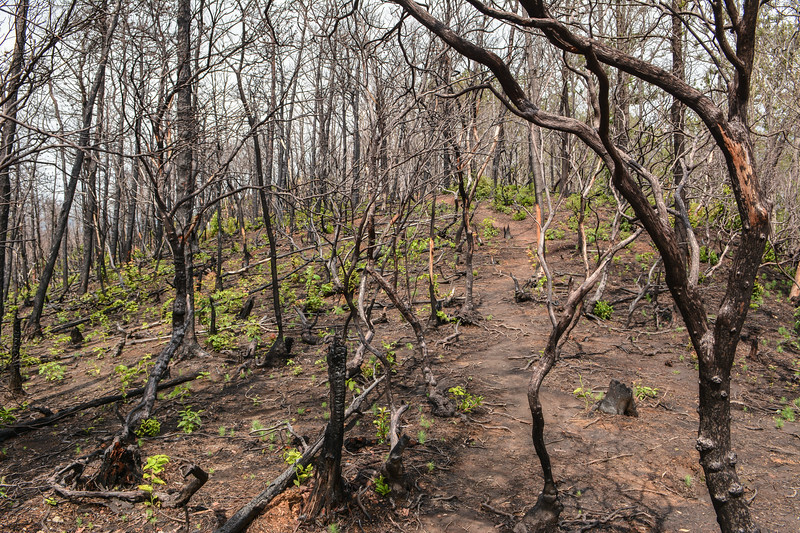 As we hiked and explored we were struck first by the devastation, the charred remains and skeletal trees; reminders of what once was a thriving, healthy forest still etched in our minds. Overwhelmed at what appeared before us, we couldn't help but be moved by the rebirth and renewal all around. Wisps of green dotted the landscape. This area may never be the same, (at least not in our lifetime) but we're certain of one thing... nature takes back its own. Upon returning home we loaded our images and looked through them, reliving all of the emotions of the experience. It wasn't until recently that the particular image below caught our attention because initially we didn't notice. 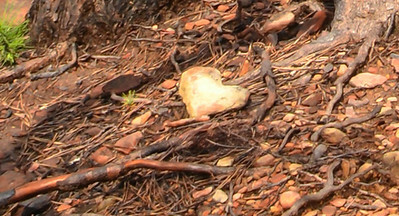 While one may be more inclined to focus on the destruction, the heart-shaped rock in the foreground concluded what we had known all along. 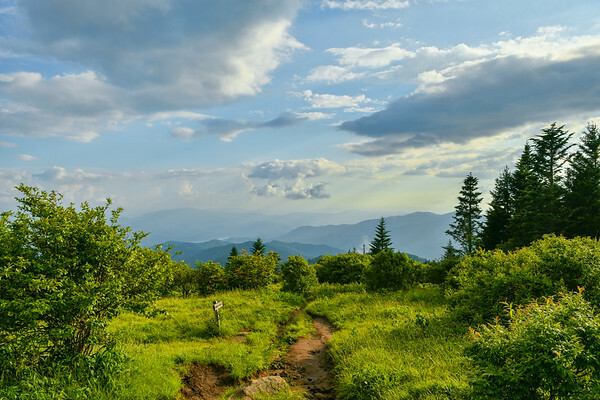 Our hearts will forever remain heavy for what once was, but our love for these Great Smoky Mountains and its promising future lives on. With Spring fever in the rearview mirror, the celebration has begun. The birds are singing with enthusiasm as we revel in the beauty around us. 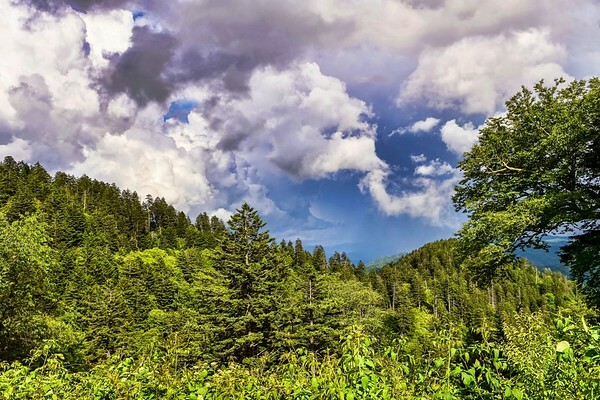 The healing process is evident here in the Smokies as people pick up the pieces and begin their lives anew. What was a terrible tragedy just a few short months ago hasn't altered your love a bit as countless numbers of you are returning to one of your favorite destinations in the entire world. In spite of the hardships this community has endured, the Spring of 2017 has been one of the most incredibly beautiful we've ever witnessed. 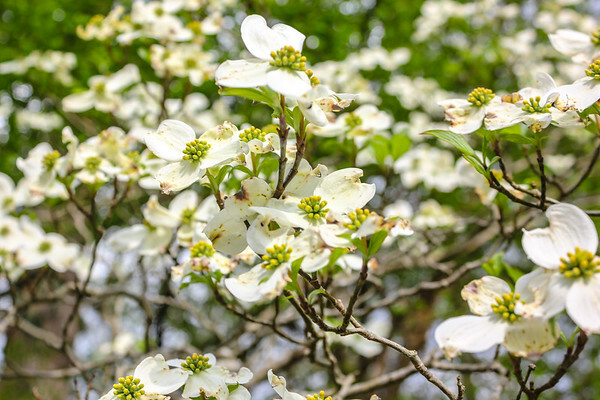 Masses of wildflowers are returning in a blaze of glory and the dogwood and redbud trees are sharing their splendor as well. 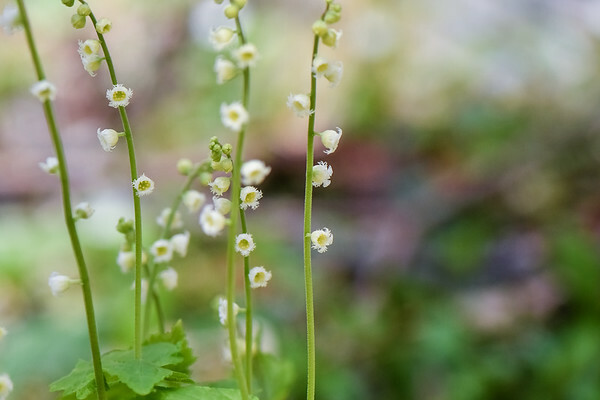 Many are blooming among the affected areas as if to scoff and prove that rebirth will prevail. We are still in awe of the generosity of spirit that thrives in these mountains - near and far. For many of you, your love runs deep, coursing through your veins. And we're more excited than ever. Happy Spring to one and all. 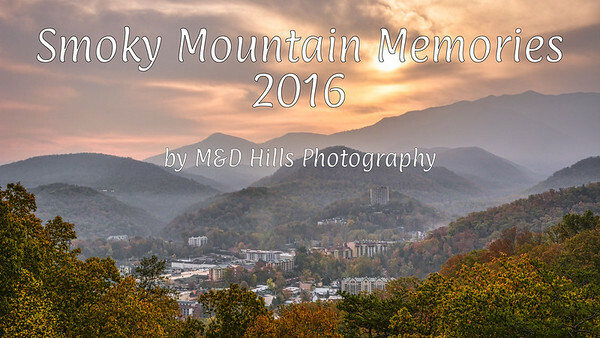 This video showcases in chronological order some of our favorite moments and memorable experiences from 2016. May 2017 bring you lots of love, laughter, bountiful blessings and lasting memories. 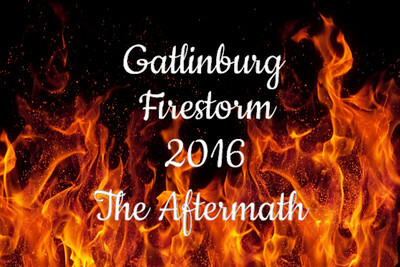 Click on each image above to read our personal perspective of the Gatlinburg Firestorm and the Aftermath. We suffer from a bit of insanity, there we said it... the first step is admitting it, right? 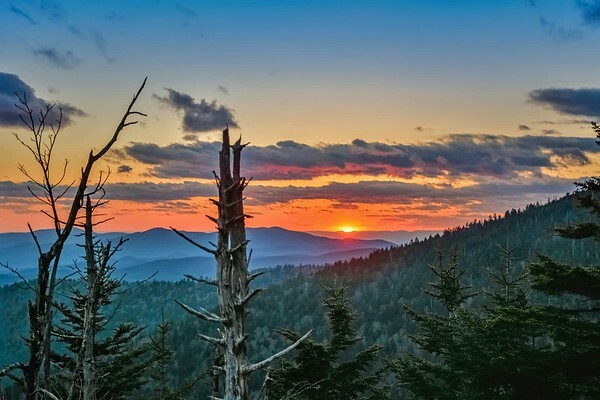 That evening, at the spur of the moment we decided that we should race up to Clingmans Dome for the sunset. 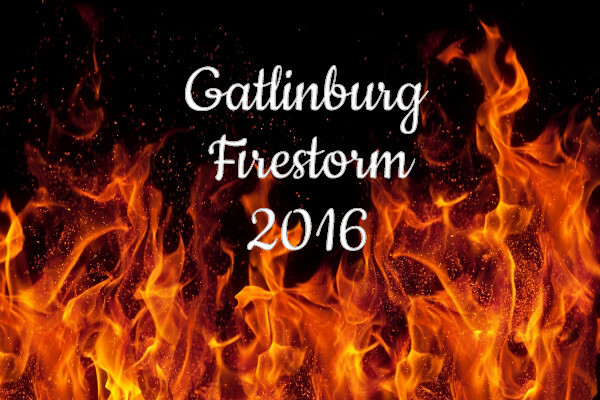 It was a breezy and comfortable 58° in Gatlinburg, so prepared with our knowledge from previous experiences we knew there could be vastly different weather conditions up top. We grabbed a couple of mid-weight jackets and headed out feeling quite adequately prepared. Upon arriving at the top, the setting sun was breathtaking, as was the weather. The temperature had plummeted to the high twenties with wind gusts near 50 mph making standing and keeping the tripod upright a challenge. With no hats, gloves, and the wind chill nearing single digits, we attempted to keep our shivering at bay and take steady shots yet were presented with another problem - we were losing the feeling in our fingers making manipulating the camera harder than ever. Once we felt that we might have at least one decent image, we retreated to the shelter of our SUV. With the heat cranked we began to slowly defrost as we made the trip back down the mountain, reliving and laughing at yet another memorable experience. 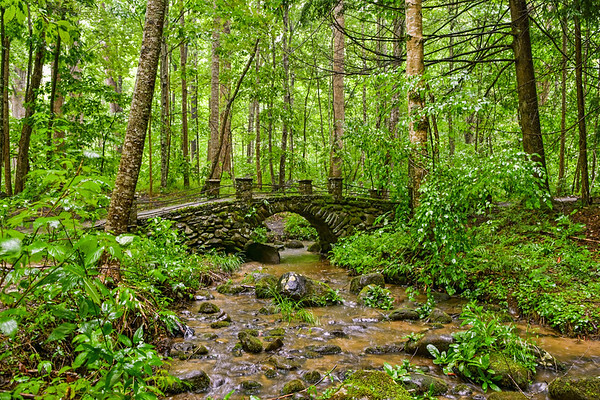 And that, our friends, is why we love springtime in the Great Smoky Mountains! We spent several hours photographing baby cubs deep in the woods on the most beautiful spring day in Cades Cove. Late in the day a dark cloud appeared and we felt a few raindrops fall, and as we discussed our options, our decision was made for us... suddenly we were in the midst of a torrential downpour! In an effort to protect our equipment we had no choice but to make a run for it. At a breakneck pace we navigated over logs and thru a trail that then had begun to flow like a stream. As we continued on, it seemed to be raining even harder, which seemed impossible, when suddenly we realized it had actually begun to HAIL. After a rough pelting from above we finally made it to our vehicle, muddy and completely drenched. We immediately dried off our gear and ourselves and drove away laughing at what we had just experienced - this wonderful memory we won't soon forget. 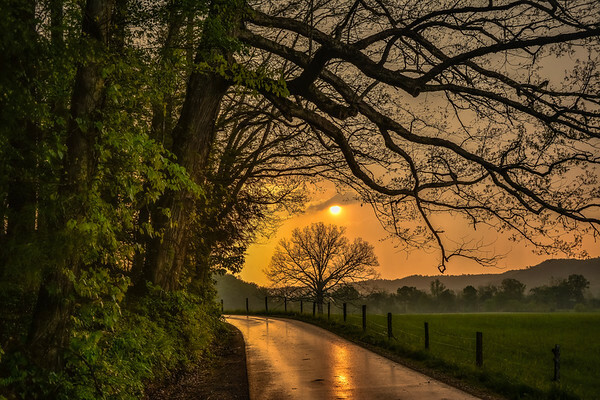 As the sun began to set we looked back and saw its warm glow being reflected in the wet roadway as it continued its path toward the horizon behind "The Tree". Such beauty proved to us that there is always a silver lining in every cloud, or cloudburst one might endure. we narrowed it down to a handful of favorites that we have assembled here for you. We wanted to take some time and share a story with you. It's rather long but contains an important message so we ask that you please find the time to read it. 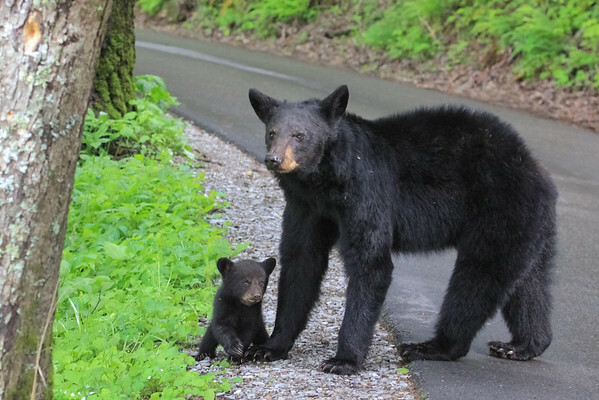 The mother bear you see in this photo was born in Cades Cove. It was her home, and the only home she knew. In January of 2013 she gave birth to three healthy cubs, and many who visited the Cove would see them on occasion. When bears are seen by the loop road it always, and we mean ALWAYS, stops traffic. Understandably people are excited to see them and want to try and capture the moment with their cameras. This particular day was no exception. We happened to be in that long line of cars stopped dead on the road. Just up ahead was this mama bear and her three babies eating berries in a field a short distance away. We found a place to pull over and snapped a few photos ourselves with our zoom lens and watched on as they began to move toward the roadway. Subsequently, those at the front of the line vacated their vehicles and advanced toward them. It was one of the longest and most unsettling "bear jams" we had ever witnessed. The bear family wanted to cross the road but with people swarming them, the mother bear became distressed and sent her cubs up a tree next to the road. One of the babies, the one you see in this photo, stayed by her side. We tried to inform those who moved in what the mother bear was trying to accomplish, and while many moved back respectfully, others continued to walk up directly under the tree with their devices to snap photos. During this time, the mother bear became frantic and began pacing back and forth trying to figure out how to get her cubs safely across. We mentioned to people that the babies would not come down unless they backed off allowing them enough space to feel secure. After doing that for so long we decided to walk down into the field and observe, watching on as this horrific incident continued. Suddenly the mother bear went up the hill and left her two cubs behind in the tree, prompting more people to move underneath it. We decided to drive to the ranger's station and report what had transpired as we were concerned for the cubs' safety. The ranger we spoke with informed us they would get there as soon as they could. By the time we returned, the traffic was moving more freely and a concerned individual told us that the mother had returned amidst all the chaos, summoned her cubs down the tree and the family had moved on. Sadly, this bear family no longer resides in Cades Cove. 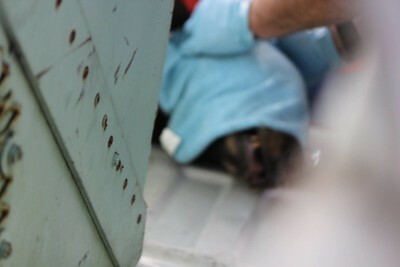 They were forcibly moved to another location because "they had lost their fear of humans". Rumors swirled that they had been fed by a tourist to draw them closer so that they could take a photo. 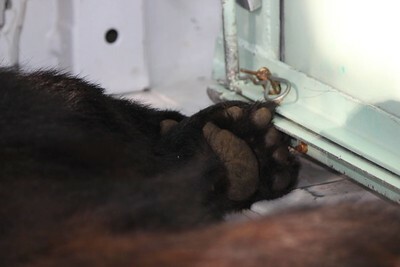 Once a bear is "food conditioned" they sometimes lose their fear, and become labeled "nuisance bears". These bears are tagged, and after so many "offenses", relocated. It causes them stress and often times they try to return endangering their own lives. Bears are not typically aggressive toward humans, but they are still wild and they need to remain that way in order to survive. Year after year, bears are moved as a result of human actions, with no fault of their own. Although it may seem like common sense, it's imperative that we NEVER, EVER feed wildlife, nor should we advance on them too closely or rapidly for the safety of all involved. It's THEIR environment, not ours, and we must respect them in THEIR home. 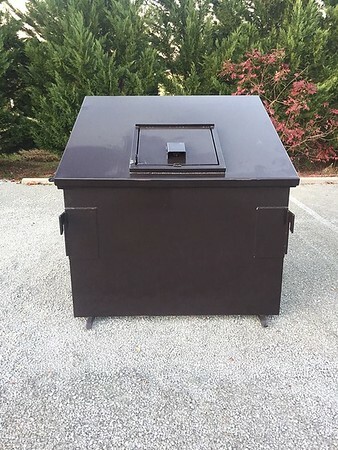 Picking up after yourself and disposing trash in bear proof garbage bins is also important. If you witness any illegal activity, please report it at once to the proper authorities. 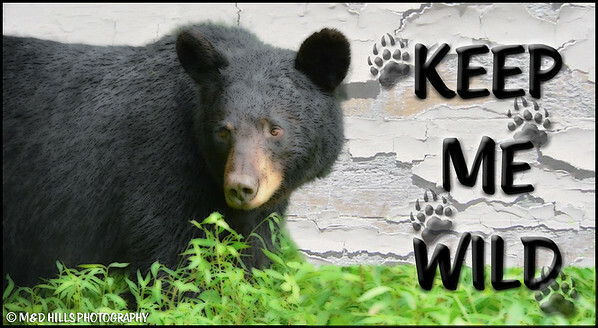 Although disturbing, these are facts, and the bottom line is, if you want to see the black bears remain in the accessible areas of the national park, please show them the respect they deserve. And let's respect each other with common courtesy and use the pull-offs if you decide to stop. Please help us help them by sharing this important message with others. 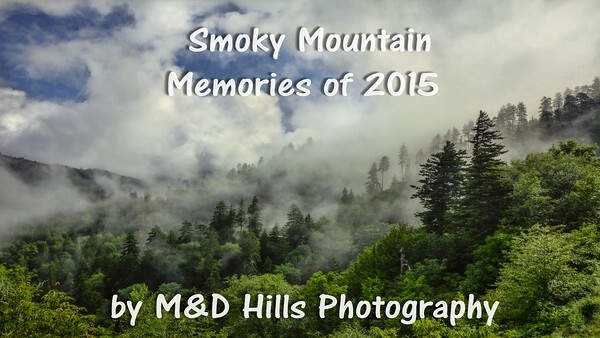 All content within this page ©M&D Hills Photography unless otherwise stated. We appreciate sharing but please do not download, redistribute or use without express written consent.